Our page is being updated for the new season. We are now into our pre-season with over 30 boys attending each week. Wednesday from 6:30 to 8:00. Everyone is welcome to come and try it out. The Reeds U16’s age group has 40+ registered players; runs 2 full teams and a full programme of league and friendly fixtures. We train Wednesday nights, 6.30pm to 8pm at the Reeds Weybridge Club Whitely Village. On Sundays we mainly play matches, interspersed with some additional training sessions. Home matches and Sunday training typically start at 11.45am. 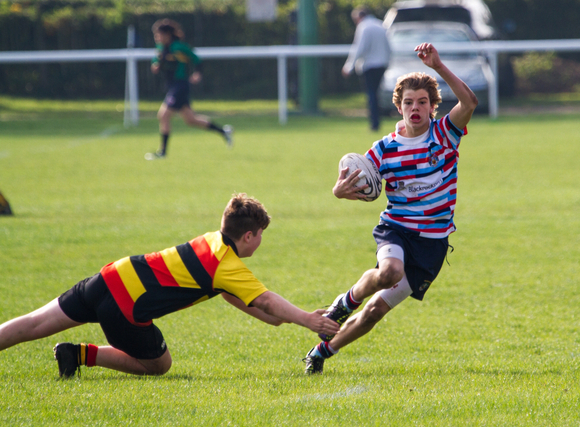 Rugby is a sport for life ……it teaches the boys valuable lessons that they implement in their every day lives. It’s all about developing life skills like commitment, teamwork and digging deep when others fail. At this age the boys have lots of pressure in their lives they are becoming young men with all the pressure that brings and on top of that they have important exams at school. Many clubs focus on the silverware they bring home as a marker of success, at Reeds Weybdridge we focus on the continued enjoyment and development of each player. With the hard work the boys and 6 coaches put in we inevitably win our fare share of trophies but what is more important is the smiles we see on their faces when they have battled it out in the trenches together. Young men need this physical release and this camaraderie to perform so we urge current players and new players to join for another fun filled season of rugby. The Reeds U16’s age group is supported by 7 qualified coaches. 2 of the coaches still play competitive rugby at senior level. Many are either are Level 1 or 2 qualified. All coaches are involved in a continuous programme of training and development supported by the Reeds club and the RFU. We also leverage specialist coaching resources within the club, when required. We focus on developing player’s core skills, to enable them to play effectively at several positions. Player movement between A and B teams is actively managed throughout the season to challenge players, help develop player core and positional skills and to ensure that we retain a strong squad ethos. Please give Reeds U15’s a try. We are very keen for new players to join the Reeds U15’s age group. All players of any ability will be made to feel very welcome. Match quality lights were installed at Reeds Weybridge during the 2013-14 season.